Visitors have been enjoying leisurely trips from Llangollen Wharf for over 100 years. 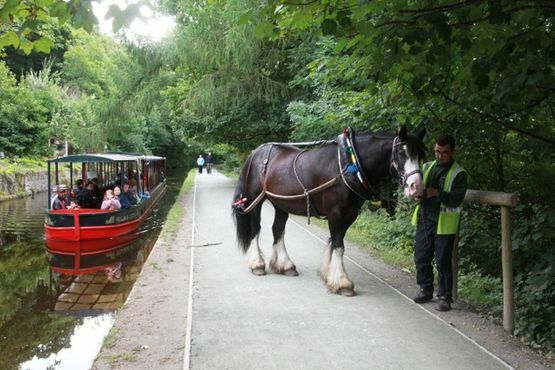 We continue this tradition by offering wonderful horse drawn boat trips along the canal, which is part of a UNESCO World Heritage Site and home to a rich variety of local flora and fauna. During colder months, our horses go on their winter holidays and return for the February half-term. However, our motorised aqueduct trips are available all year round except in January when the boat is undergoing annual maintenance. A return boat trip from Llangollen Wharf, running every 30 minutes during the school holidays and roughly every hour at other times. This is the perfect activity whatever the weather, as our modern purpose-built boats have both inside and outside seating areas. The trip is just long enough to allow you to relax and unwind, making it perfect as a gentle start or soothing end to your day, or as a moment of peace in the middle of a hectic one. 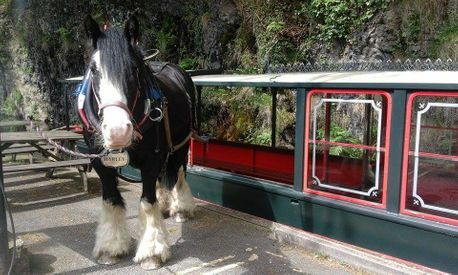 Experience for yourself the pace of life in "the olden days" whilst gazing out at one of the most beautiful canals in Britain, and admire the strength of our gorgeous horses as they easily pull your boat through the water. This is your chance to see the mesmerising Horseshoe Falls on the River Dee. The trips depart every Saturday and Sunday throughout the season and also Tuesdays in the school holidays. You can book this trip up to two weeks in advance; please check our online booking system for exact dates and times. This is the perfect activity whatever the weather, as our modern purpose-built boats have both inside and outside seating areas. Take in the splendour of Thomas Telford’s Horseshoe Falls at the head of the Llangollen Canal, along with the newly restored Chain Bridge at Berwyn that reopened in 2015. 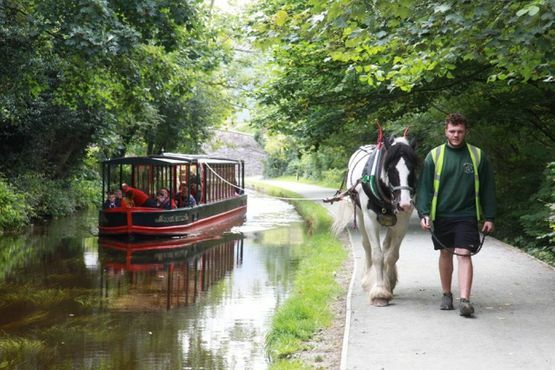 This is possibly the most beautiful length of canal you will ever see and the horse drawn trip is definitely the most peaceful and relaxing way to see it. Our horse drawn boats can be booked for private charter experiences of either 45 minutes or two hours for groups of 20-52 people. These trips can run on the hour or half hour between 10:30am and 3pm at a time to suit your party’s schedule. For availability and prices contact the Wharf.